Let me begin by saying thank you for your military service. As a veteran, I appreciate everything that you do for our great country. In my opinion, there is no greater honor than leading soldiers, especially in combat. As Company Commanders and small unit leaders, we have an awesome responsibility that most civilians will never understand. If you’re like most Company Commanders, you are overwhelmed, overworked and perhaps, frustrated. You love what you do, but you could use some extra help and advice. Trust me, I’ve been there and done that and I know exactly how you feel right now. I’ve always believed that the Army National Guard and Army Reserve should do a better job preparing officers for Company Command. The training you get before you take command (if you get any training at all) is marginal at best. You’re probably reading this webpage because you are looking for solutions to your challenges. You are looking for some help with your Company Commander duties. You’re trying to find information, tips and advice on HOW to be a better, more effective and more efficient Company Commander. You’re trying to soak up all the knowledge you can get to help you hone your leadership skills. If that describes you, I’m here to tell you that you are in the right place at the right time! My name is Charles Holmes. My friends call me Chuck. I hope you will do the same thing. That’s my mug shot you see on the left hand side of this paragraph. 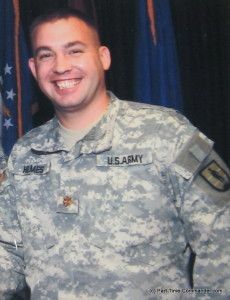 I am a former ARNG Major and Company Commander. In addition, I am the creator of this website, Part-Time-Commander.com, one of the most popular websites in the world for officers, NCOs and soldiers serving in the Army National Guard and Army Reserve. I’m also the author of countless books and training products for the same audience of people. Like you, I’ve been there and done that. I spent two years in a very successful Company Command. My experience was very rewarding AND challenging. Looking back, I can tell you that I wasn’t fully prepared for Company Command when I first got started. I thought I was, but I was wrong. I only wish someone would have sat down with me and given me a class on how to be a successful Company Commander. 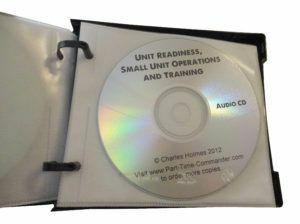 I wish something like my Company Commander Training Course would have been available for me to purchase and study. Like you, I attended my Captain’s Career Course and Pre-Command Course before command, but those courses didn’t teach me even 20 percent of what I needed to learn to be a successful Company Commander. 99 percent of what I learned in Company Command was through on the job training and through trial and error. Sure, these lessons were valuable, but it would have much better to learn most of these lessons BEFORE I took command. Fortunately for you, I documented everything I learned during my time in command. I kept track of what worked and what didn’t work. I kept a journal of everything! All of these lessons are documented in my Company Commander Training Course. This course is designed to teach YOU what you need to know to have a SUCCESSFUL and FULFILLING Company Command. This training program comes in audio format, so you can listen to it whenever you want. In all, there are 16 audio CDs. To clarify, each CD is me talking about specific issues and challenges. It’s not an audiobook. I’m not reading anything. Nothing is scripted. I follow my outlines and share all of my knowledge and experience with you. Here’s what you will get on the CDs. 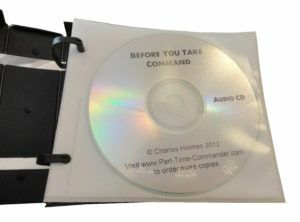 On this 39-minute audio CD, you will learn everything you need to do before you take command. This includes your change of command inventory, left-seat-right-seat-ride, change of command ceremony, and more. I also talk about what jobs you should have before you take command, what schools you need, and other tips you can follow to help you be better prepared for your new job. 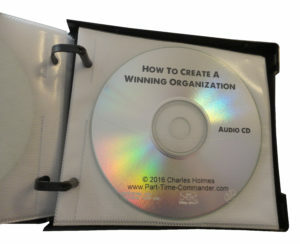 On this 27-minute audio CD, you will discover what you should do during your first drill weekend, your first 90 days and your first year in command. We break it down and give you specific tips for success. I will also share my top 10 tips for success during your first year in command. 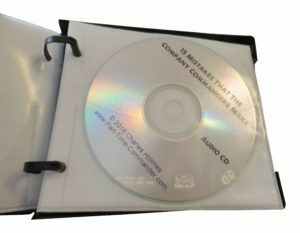 This CD talks about common mistakes, and some dumb mistakes that many Company Commanders make. These are things you want to avoid at all costs. This information will help you be a better Company Commander. 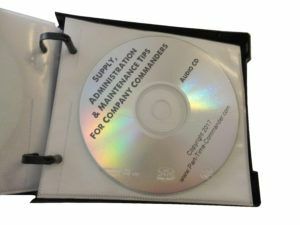 On this 26-minute audio CD, I will share my best tips about how to manage your supply, admin and maintenance issues. I will teach you what your role is and what you should have your XO and staff doing, to keep everything running smoothly. Your ultimate goal is to make sure your unit is highly motivated and highly trained. You want high esprit de corps. You want soldiers to perform at a high level, while enjoying their job and feeling like they are part of a winning team. This CD will teach you how to do that. The relationships you have with your XO, 1SG, Platoon Leaders and AGR staff are vital. I will share insights about what you should do with each person to create a successful relationship. 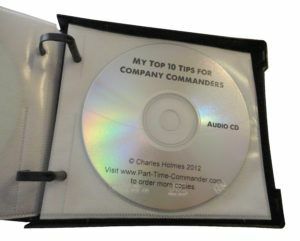 In this audio CD, I will share my top 10 tips for new Company Commanders. This is information from my experience along with some helpful tips from some former Company Commanders. This 48-minute audio CD is a list of the most common questions that current Company Commanders have. I put out a survey to more than 100 former Company Commanders and these were the “most common” questions they had. I will do my best to answer each question for you. How do you deal with difficult soldiers? How can you lead others without micro-managing? How can I improve the morale in my unit? What is the biggest leadership mistake most company commanders make? What should I do about Equal Opportunity in my unit? How much time should I spend with my soldiers and how should I spend my time? Who should the commander counsel/get advice from? How should you deal with personality conflicts? What is the best way to bridge the officer/NCO gap? How do I motivate others? Are there any classes/courses I should take to be a better commander? How can I get everything done with so little time? 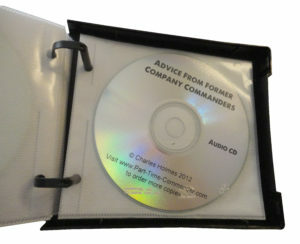 On this audio CD, I will share the top 20 bits of advice from former Company Commanders. I personally interviewed 20 former commanders and asked them to share their most insightful advice. I took one piece of advice from each commander and I summarize what they said on this CD. This is a powerful CD. In fact, this might just be the most valuable CD in this entire course. After all, I’ve found that the best way to learn is to learn from others who have already done what you are trying to do. 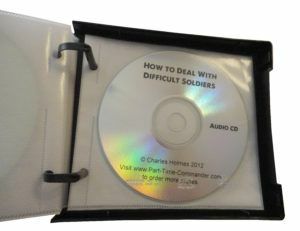 On this CD, I will share all of my secret tips on how to deal with difficult soldiers. I will teach you how to discharge bad soldiers, how to counsel others, reprimand poor performance, and more. We will discuss step-by-step instructions on what you should do with soldiers that cause the most problems. We will even discuss common situations and what you should do about it. 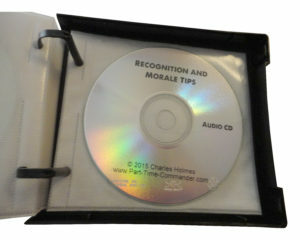 On this audio CD I will share tons of creative things you can do increase morale in your unit and keep the esprit de corps at an all time high. I’ll also provide guidance on how to create an effective rewards program so you can recognize your Soldiers when they deserve it. 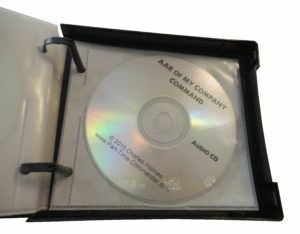 On this audio CD, I will talk provide an AAR of my own Company Command. I’ll talk about what I did right, what I did wrong, and what I would have done differently. You can learn from my mistakes and successess. 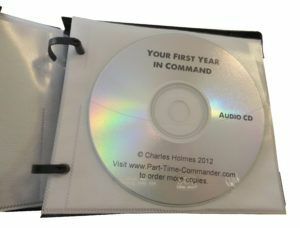 Please keep in mind that my Company Commander Training Course is a physical product that will get mailed to you. In all, there are 9+ HOURS ( 556 minutes) worth of recorded training on 16 audio CDs. This comprehensive Company Commander Training Course will prepare you for success as a Company Commander. You can listen to the training over-and-over. You can review the material when you have questions. You can put a CD in your car as you drive to and from drill weekend. You can study the information at your own leisure. You can use the information you learn to develop your subordinates. 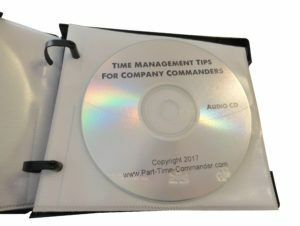 And best of all, you can add this Company Commander Training Course to your arsenal of tools and resources in your leader’s library. Whenever you have a question or a dilemma, you can refer to our guide to find answers to your problems. I can tell you one thing. You won’t find anything else online like our program on the internet. And to the best of my knowledge, there isn’t any other course like this offered by the Army either. This is the course you wish the Army would give you before you took Company Command! Sure, you might get lucky and attend your Captain’s Career Course and Pre-Command Course before you take command, but those courses won’t fully prepare you for your command responsibilities. And if you’re like most Company Commanders, you’ll be expected to figure things out on your own. While that sounds like a noble idea, the fact is you don’t know what you don’t know. The purpose of this course is to fill the gap and give you a 95 percent solution BEFORE you take command of your unit. This course will give you a cutting edge above your peers and help position you for success as a commander. I wish I would have had access to a course like this before I took command. I would have gladly paid much more than what I am selling this Company Commander Training Course for. In fact, you can get this course for approximately what you would get paid for 1/2 day’s work at drill weekend. That’s a super deal considering it would take you MONTHS, maybe YEARS to figure out all of this information on your own. What I’m going to do right now is ask you to INVEST in your future. It’s a proven fact that leaders are always looking for ways to improve their skills and performance. Smart leaders invest in themselves to learn the required skills of their profession. They read books, attend seminars, have mentors and do what they can to hone their skills and develop their potential. Simply put, great leaders are students of their profession. They commit to life-long learning and do whatever they can to gain KNOWLEDGE. I’m asking you to take out your credit card right now and buy this course. I’m asking you to invest in you! However, you can buy my Company Commander Training Course with confidence. I offer everyone a 30-day, no questions asked, money back guarantee on your purchase. If you purchase this course and aren’t happy with the material, you can return it to to me for a no questions asked money back guarantee. I stand behind everything I sell and want you to be 100 percent satisfied with your purchase. In addition, please know that I am a trusted business owner. My website has been around eight years now and we’ve sold thousands of products. In all that time, I’ve only had five product refund requests! I immediately refunded their money without hesitation. I am proud of that. You might be wondering, how much will this Company Commander Training Course cost me? In my opinion, this information is worth much more than I am charging for it. I could easily charge $497 for this course because of the value it provides. But, I’m offering it at a much lower cost. It’s not $397. It’s not $297. It’s not $197. 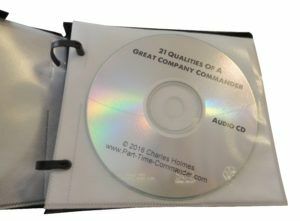 For a limited time, you can get my Company Commander Training Course for just $97, plus shipping. Still not convinced? Don’t take my word for it. Here’s what some of our happy customers are saying. Yes, Chuck, send me the 16 audio CD course. I realize it is just $97 plus shipping, and it comes with a no questions asked, 30-day money back guarantee. This is what it will look like when you get it in the mail. Q: Is this course relevant for Active Duty Army Company Commanders? A: Yes, I would bet that 90 percent of the information is relevant for Active Duty Army Company Commanders, even though there is specific information only relevant for USAR and ARNG Company Commanders. Q: Is this relevant for Air Force, Navy, Coast Guard and Marine Corps Company Commanders? A: Most of the information is. But, there are acronyms and Army specific things in it. Overall, I think you would find it very beneficial. Q: Is this is a digital product? A: No. It is a phsyical product that you can hold. It will be sent via the postal service. Q: Do you offer discounts for multiple quantities of the same item? A: No. I kept the price as low as possible so people could afford to buy multiple quantities if desired. Q: Do you do overnight shipping? A: I ship all purchases via USPS Priority Mail, which normally takes 2-3 days for delivery. All items ship within 2 business days. A: I only ship to the USA and to APO addresses. This product comes with a 30-day money back guarantee. If you would like to return your item, please send an email to chuck@part-time-commander.com. The views in this course are my own and are not endorsed by the DoD, the Army, Army National Guard or Army Reserve. This is not a government endorsed course. It is created my Charles Holmes, owner of Part-Time-Commander.com. The material is copyright protected. Unauthorized reproduction or distribution is strictly prohibited. How old is the material in the Company Commander’s Training Course. As you know, there has been significant modifications/updates to the Army’s policies and regulations over the past few years. I want to make sure I study for the current environment. I believe it is still very relevant. 90% of the issues commanders deal with never change. It’s mostly just the acronyms that change. If you don’t enjoy it, you have the option to return it for a refund.